Beautifully assembled from bits of real vintage posters and artistically ‘aged' to perfection, Stupendous Collection of Turnip Seeds is available in three variations. An auction of turnip seeds with far-fetched medical claims? Which sort of wild oats exactly are we talking about? And who is Joseph Newman, the mysterious auctioneer? This can only be a print from the curious world of Vintage Mashups. Beautifully assembled from bits of real vintage posters and artistically ‘aged' to perfection (it looks like it's been folded up and left in your grandparents' loft), Stupendous Collection of Turnip Seeds is available in three variations and each print comes with an information sheet. Width: 331mm (13"). Height: 482mm (19"). Digital print with pigment inks. Stupendous Collection of Turnip Seeds is printed on 230gsm matt archival paper. Please select one of the 'Framed' options above. Prints are framed professionally, to order, by a Guild Commended Framer using archival-quality materials and usually ship within 7 working days. Frames are available in a vintage-looking, ‘distressed’ black finish that perfectly matches the aesthetic of the print. The frame is sealed on the back to prevent dust from entering and D-ring attachments and hanging cord are also fitted so that the print will arrive ready to hang. A card is also attached to the rear of the frame containing information about the print and how it was made. The price includes shipping, so no additional charge will be added at checkout. We package framed prints carefully to protect them from damage during shipping. Framed prints are shipped via Parcelforce and a tracking number will be sent to you via email as the print is dispatched. The overall dimensions of the frame are: Width = 366mm, Height = 519mm, Depth = 20mm. The frame itself is 25mm wide all around. We take great care with packaging to help ensure that your print reaches you in excellent condition. Prints are wrapped in acid-free tissue paper and shipped in strong tubes with secured end caps. We ship worldwide, using the Royal Mail's First Class and Special Delivery services (for UK orders) and Airmail and International Signed For services (for all other orders). Depending on the destination, orders for multiple prints may arrive in multiple packages. Framed prints are shipped via Parcelforce and are framed to order, so will take longer to arrive. Please see the information under Framing above. 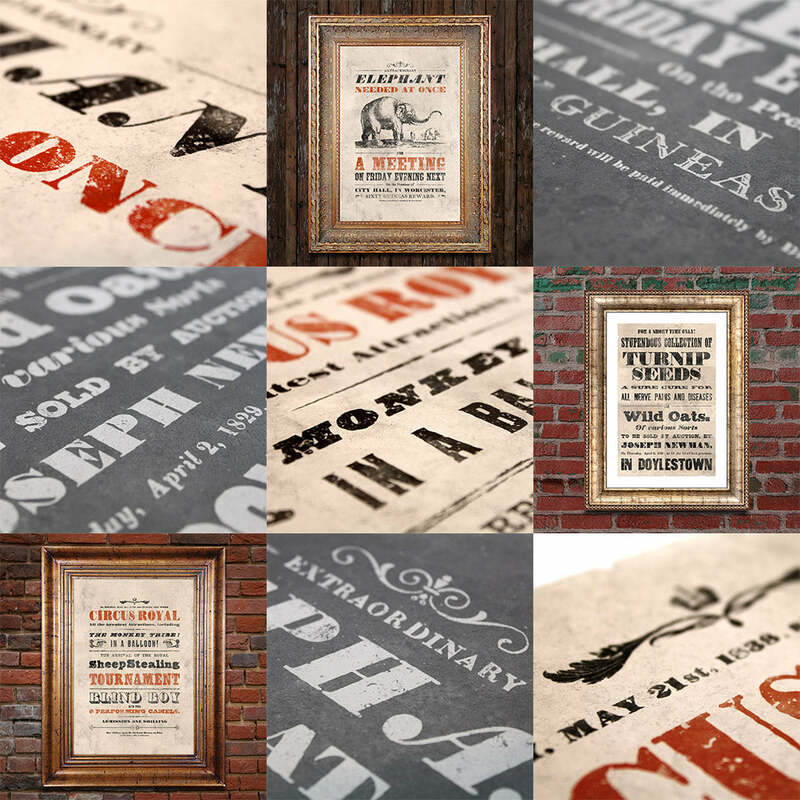 Here at Kite, we've always been just a little bit obsessed with Victorian posters. Perhaps it's the amusing and bombastic sincerity of their old-fashioned language. It could be their impressive disregard for typographic simplicity. Or maybe it's the fact that old things just seem to have a beauty all of their own. Having collected hundreds of examples over the years, the idea for Vintage Mashups came about as a way to have some fun with the past and simultaneously produce something completely original that reminded us of why we've always loved looking at these things. Every line of type and image on these posters is real and comes from genuinely old source materials like vintage posters, books and advertisements. But we've mixed them up. Along the way, we've created some fantastic and ridiculous-sounding events that never actually happened. All our Vintage Mashups prints have been skillfully distressed and are digitally printed with pigment inks that should, perhaps ironically, keep them looking old for many years to come.